I've been reminiscing this morning about the 4th of July in 1976. It was our nation's 200th anniversary, and I lived in Rhode Island then. I was 15 1/2 and massively excited about the Tall Ships. My grandparents had bought a beach house in 1938. The thing to do back then was buy a seasonal cottage by the bay or ocean, and the family goes to the cottage all summer while the men commuted to work. The state’s nickname is The Ocean State because of so much ocean coastline everywhere. So in 1938 my grandparents bought a cottage on a small hill overlooking Narragansett Bay, which led to the Atlantic Ocean. It was unfortunate/fortunate...the 1938 hurricane wiped out RI as far inland as Providence, and destroyed huge swathes of coastline and many hundreds died. It wrecked the cottage pretty bad. It was unfortunate that they had the beach house only a few months before the state’s worst hurricane hit, but fortunate because they could rebuild it to their liking. Over the years they added on and enlarged it, slowly. The Bay was great. It was a giant playground for us kids and cousins. Back in the 60s and 70s kids did stuff and we didn’t die, lol. Every kid had a ramshackle boat of some kind or another. My dad used to tell us when he was a kid they’d come to the beach house for the summer and he’d find a boat with holes in it abandoned on some mudflat, and he and the cousins would fix it, and they scraped up a motor from somewhere and fix that, and then they’d go out onto the Bay and get quahogs and fish for bass. (Quahogs are a clam you dig out of the mud flats at low tide, but way out far and low tide only). In my day we had a new Boston Whaler to go around in. Can you imagine sending your ten and twelve year old kids out onto the bay in a boat for the afternoon and say ‘come back for dinner,’ LOL! But that’s what we did, mess around in boats, and mess around in the water and jump off the dock all day until our hands were pruny and our lips were blue. On the 4th of July it was great because you could see all the towns’ fireworks from across the bay. Us kids would be running up and down the beach in the dark holding sparklers and whooping with joy as kids do. We were barefoot of course and I remember stepping on a sparkler that had just gone out and someone had thrown to the sand. It really hurt and the shock of the fiery pain was too much for old sensitive me, so forever after that I was not such a huge fan of sparklers. But I do think they are pretty. The grownups had all sorts of amazing and highly dangerous fireworks. Before they were banned by the US government in 1966, they set off cherry bombs, and there were bottle rockets and lots of other things they spent hundreds of dollars on to have a blast creating their own fireworks show. Then we'd watch everybody else's show. 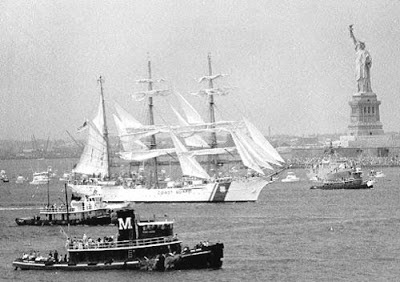 In 1976, for the first time in history all the Tall Ships from around the world were going to gather at Newport RI. It was a huge, huge event. We’d eagerly read the paper every day for months before the time, watching to see which new Tall Ship was responding to the invitation. The list was growing longer and longer. Tall Ships from Russia, Argentina, England, all over, were going to sail up Narragansett Bay from Newport in a parade. The Newport Bridge was lined with people, thousands upon thousands lined the shorelines, and the Forts on all the islands dotting the bay. We piled in boat, and got into the mix of the thousands of boats crowding the bay to see this historical event. Part of the event was a tall ships race from Bermuda to Newport. Wow, that must have been something to be in Bermuda’s Hamilton Harbor and hear the cannon and see them unfurl sail and take off across the bounding main! There is something so elegant and majestic about a Tall Ship under full sail. The Secretary of the Navy came to RI for the ceremonies, and after the ships parade they docked at Newport and you could tour them. Prince Harold of Norway came over on one of them and also attended the ceremonies. It was so much fun. Eighteen tall ships from 14 nations came to RI for the 1976 4th of July. The boats were actually heading to NYC for the actual 4th where there would be a massive fireworks celebration and another parade up the Hudson River. From Newport RI Archives. 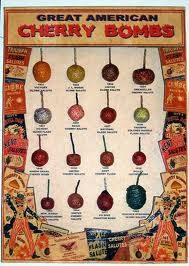 See the men on the spars?! 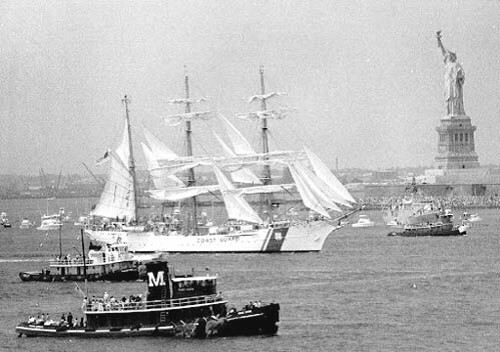 This is a picture of Operation Sail Bicentennial 1976 in NYC from the South’s Grit Magazine! 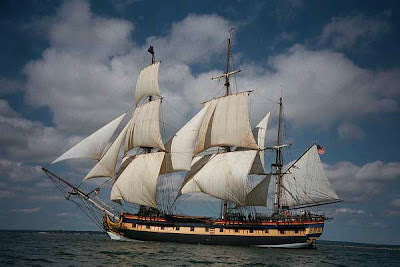 The ship is the Coast Guard Tall Ship USS Eagle. What a great ship! “Operation Sail 1976 provided a centerpiece for the U.S. Bicentennial celebration. 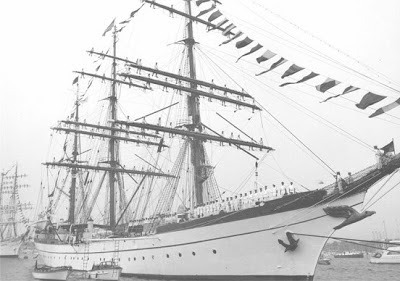 The event took five years to plan, featured more tall ships ... including the Soviet Union's czarina of the sea, the Kruzenshtern, which Frank Braynard had won over against all political odds on a trip to Moscow. ... They proceeded "in company" to New York, where they were met by a vast spectator fleet. In partnership with the Navy, Operation Sail 1976 also resurrected the tradition of holding an International Naval Review, which brought together a peacetime armada of 50 warships under as many flags. From the deck of the USS Forrestal, President Gerald Ford reviewed the parade of sail, complete with a 21-gun salute. In Frank Braynard’s estimation, it was "the biggest assemblage of ships since the Battle of Navarino in 1827." That was a day you just never forget, the elegance of the ships and the pride in our nation and the celebrations all over. It felt great to be a part of it and just to be alive and young in America. So cut to 1994 or so. My husband and I were living aboard our 37 foot yacht and had sailed far up the James River in VA and anchored at a kid of watery cul de sac. Not many cruising sailboats went up this far, it was a long way up and a long way back. But the high green hills and the peace were what we sought, and even better was knowing the William and Mary College was a short distance away and adjoining that, a park. It would be quiet and far from the cruising hubbub that sometime got to us as we cruised south to the Bahamas with a fleet of other like-minded live-aboard cruisers. It was the equivalent of taking a turn onto a dirt road as you drove south on the highway from GA to FL. We got settled, anchoring the boat and buttoning up the sails etc. We were thinking about what to make for dinner when we heard a ‘whoosh’ and turned to look at the river entrance. It was a tall ship! The HMS Rose (right) was making a slicing sound in the river and the whoosh was the wind in their sails. Our boat was the only boat in the river and immediately the Rose aimed for us. They lowered the US flag and put up the Jolly Roger, lol, a bunch of sailors being trained were now having a bit of marine fun. They circled around us under full, billowing sail. It was thrilling to see a tall ship this close, just 50 feet away. As they tacked around us and sailed a bit further away, they let off the cannon! A boom and a puff of smoke and cheers from the sailors broke the stillness of the quiet waters and woke the sleeping geese along the shore. We laughed in joy and just like that, the ship swapped the Jolly Roger for the US Flag again and sailed out of the cul de sac and back down the James River. We felt honored to have been given this treat. If we hadn’t seen it ourselves we would not have believed it. It all happened so fast! The collegiality of the sailors on the ocean is universal, irrespective of nationality or type of ship or anything. It hits us hard when a ship sinks and even worse a stalwart old workhorse is lost to us. In Hurricane Sandy last October, the replica of the HMS Bounty sank off NC. 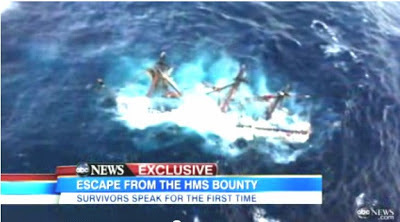 This Bounty was the very same used in the 1960 s film Mutiny on the Bounty and the same ship what was used in the Pirates of the Caribbean movie. This was a shocking photo to many people-and a sad one. Not only the majestic ship of the sea is gone but two people lost their lives, including the captain- who was never found. The crew says he said he’d go down with the ship. The Coast Guard concluded that he did. He had snatched a photo of his wife from his captain’s desk first and clung to that as he went down. He died with honor. Captain, I salute you. For us mariners, when a ship goes down it’s like losing one of our own. Growing up in Rhode Island we were on the water constantly, it was part of us. The wind, the tides, the fog, the lighthouses, the buoys…all part of our language. Boston's harbor, Narragansett Bay in RI, Nantucket's whalers, Gloucester's fishermen, Plymouth's Mayflower which we would go see on school field trips. The sea is in my blood. I’ve lived aboard my own boat, sailing almost 12,000 nautical miles. I've been on ferries, skiffs, cruise ships, ice breakers, barges and schooners, and my knees instinctively know how to bend and blend with the waves and the motion of the boat. I have been through mighty storms and anchored in quiet waters. 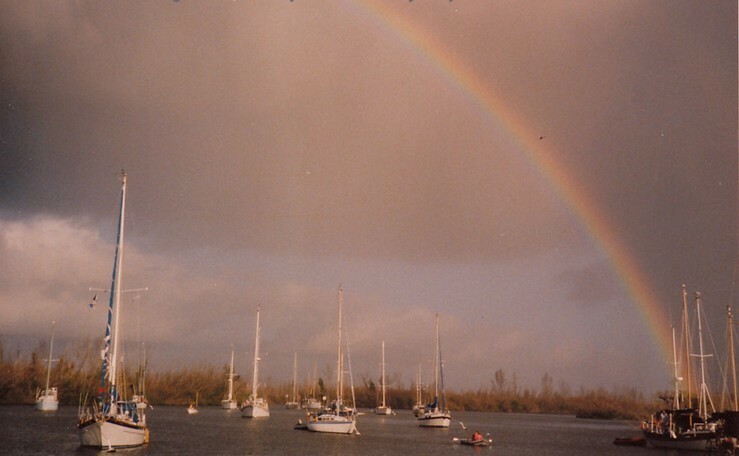 I’ve seen the rainbow over the harbor and the moon rising above the phosphorescent waters. I have lived this verse from Psalms, and it made me see the greatness of my Lord and the smallness of myself, a human not worth even His notice as an unsaved sailor, but later saved by His grace. Looking back I see how tremendous is the earth and the seas and all their secrets. He brought us safely to our desired havens of safe ports again and again, and later, as a soul lost in the sea of sin, He brought me out of the miry ocean to the haven of His bosom, justified and righteous, dry and warm, forever.